Continuing with Krzysztof Kieślowski’s Three Colours trilogy, each film exploring a principal of the French Revolution, Red is the chapter that examines fraternity. This is actually the final part of the trilogy, but I’ve watched it before White for reasons literally too boring to explain. Like Blue, this one opens with another automobile incident, as a young woman named Valentine (Irène Jacob) accidentally runs over a dog in Geneva. Fortunately it’s not too badly hurt, and she takes it to its owner, a retired judge called Joseph (Amour‘s Jean-Louis Trintignant) who turns out to be eavesdropping on his neighbour’s phone conversations. Meanwhile, Valentine’s neighbour Auguste (Jean-Pierre Lorit), whom she never meets, appears to be living out Joseph’s own backstory (he even looks like a young Trintignant in The Conformist). I’ve made it sound needlessly confusing; in Kieślowski’s hands, it all makes beautiful sense. By design, Red is warmer and more fulfilling than Blue, with none of the scenes where people sit moodily in cafés. Every moment captivates and every action resonates; nothing is insignificant, and that is what Kieślowski conveys. Without being realistic, this is a film with great insight into real life. Actions have consequences, people form connections and blind luck can come along one day and run over your dog. Every element is masterfully handled: characters who all seem to have lives outside of the film, an unconventional approach to narrative that makes it impossible to predict what’s about to happen, and evocative music by Zbigniew Preisner. 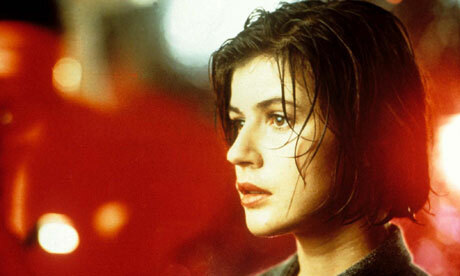 Kieślowski brings together all these strands like telephone cables, expertly combining style and meaning. He explores human interconnectivity through ingenious direction and immaculate production design; red dominates the screen, as do Jacob and Trintignant themselves. From the opening shot down a network of telephone wires to the gratifying climax of the trilogy, Red is a unique drama about the people you’ll meet, and those you won’t. Tragically, Kieślowski died suddenly in 1996. For years to come, his final film will be pored over by audiences, and pawed over by dogs.